Maimeri varnish imparts a variety of beautiful finishes, from bright and shiny to matte, to your fine artwork. 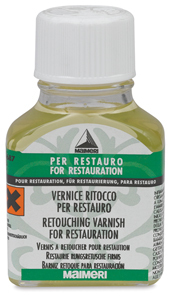 A fast-drying light mastic varnish for retouching and restoration. The finish is moderately shiny, and will not yellow. Glass bottle with twist-off cap.